Our best-ever burner technology housed inside a new, modern design, the RBS® range offers ultimate performance. Perfect for gourmet-food lovers who are serious about grilling, the advanced burner technology promises exceptionally powerful and evenly distributed heat of over 250°C across 90% of the cooking surface for healthy cooking with fewer flare-ups. Offering maximum cooking versatility thanks to the new modular culinary insert feature from Campingaz, consumers can enjoy flavours from around the world with options to integrate a wok, pizza stone and more into the grill. The new, patent pending Campingaz InstaCleanTM System ensures cleaning the barbecue is easy. Discover the ease of multiple cooking and grilling options with Campingaz® Culinary Modular Barbecue System. Simply take out the inner ring of cast iron grid and drop in one of the Culinary Modular Barbecue accessories (sold separately). Why not serve up fresh pizza baked on a pizza stone? Or indulge in a delicious grilled paella made in a Spanish non-stick paella pan. If exotic stir-fries make your mouthwater then use the carbon steel wok with non-stick coating. Or grill your chicken to perfection on the poultry roaster. Perhaps you are just simply looking to upgrade your stamped steel grid to high quality cast iron to achieve steak perfection? 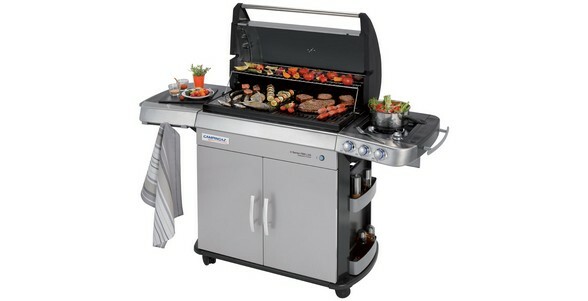 The Campingaz® Culinary Modular Barbecue System offers every option your gourmet barbecue heart desires. System included on the following models: 4 Series RBS EXS, 4 Series RBS LXS, 3 Series RBS L, 4 Series Cast Iron EXS, 3 Series Cast Iron EXS, 4 Series Classic LXS, 4 Series Classic LS Plus, 4 Series Woody LX, 3 Series Classic LS Plus, 3 Series Woody LX. Available as upgrade on the following models: 4 Series Classic LS, 4 Series Classic L, 4 Series Woody L, 3 Series Classic L, 3 Series Classic LS , 3 Series Woody L.
Temperatures of and above 250°C are recommended for perfect direct grilling and searing. It is important to have such temperatures across most of the cooking surface - nothing is more annoying than having part of the food already well done while the rest is still uncooked. Our 3 & 4 Series grills reach temperatures above 250°C on at least 90% of the cooking surface so the grill can be used more efficiently. The control knobs allow the barbecue chef to decide where he wants to have really hot areas and where he wants to have less heat. Enjoy more time having fun with family and friends rather than spending hours cleaning your barbecue after an enjoyable grill party. The system allows you to remove all dishwasher safe parts in less than 60 seconds. They are sized to fit a standard dishwasher. This brand new system is featured on all Campingaz 3 and 4 Series barbecues. Quick, simple and no mess involved!